Aviva Investors, the global asset management business of Aviva plc, has agreed to forward fund the development of Two New Bailey Square, a best in class 187,241 sq ft office building in Salford, Greater Manchester, for £113 million. The purchase was undertaken on behalf of the Lime Property Fund as part of its continued investment into high quality, long income real estate in the UK. The development, which is expected to complete by the end of 2019, is pre-let to Salford City Council on a 25-year lease subject to annual RPI-linked reviews capped and collared at two and five per cent. Two New Bailey Square occupies a prominent position in New Bailey, a major mixed-use development delivered by the English Cities Fund in Salford, adjacent to the River Irwell and opposite Manchester’s internationally renowned Spinningfields business district. The deal is the latest in a series of key development milestones at New Bailey after it was recently announced that a second multi-storey car park, which has been pre-let by NCP, is currently under construction. Also on site is Riverside House, a Grade A office development situated directly opposite Two New Bailey Square that will deliver an additional 11,000 sq ft of quality space to the market. Aviva Investors has identified Greater Manchester as a region of major growth and it forms part of a targeted strategy to focus on fewer but stronger UK cluster locations. In particular, in an increasingly digital, interconnected world, with rising numbers of automated professional jobs, the sustainability of cities is a key driver of real estate investment decisions and Aviva Investors believes the Manchester office market looks better placed to prosper from the influence of the knowledge-based economy than most. The property, which will comprise large open floor plates of up to 17,933 sq ft and private outdoor terraces across 10 floors, will be built to the highest sustainability credentials with a ‘Grade A Excellent’ BREEAM rating. The scheme will also include a basement with 50 car parking spaces and street level cycle facilities with 102 bicycle spaces and is located in close proximity to the city centre, the Inner Ring Road and Salford Central Railway Station. Lime Property Fund is a secure income long lease property fund managed by Aviva Investors with over £2 billion of net asset value. The fund, launched in 2004, targets property investments let to strong tenants on leases with inflation-linked or fixed-rental uplifts and lease terms of 15 years plus. 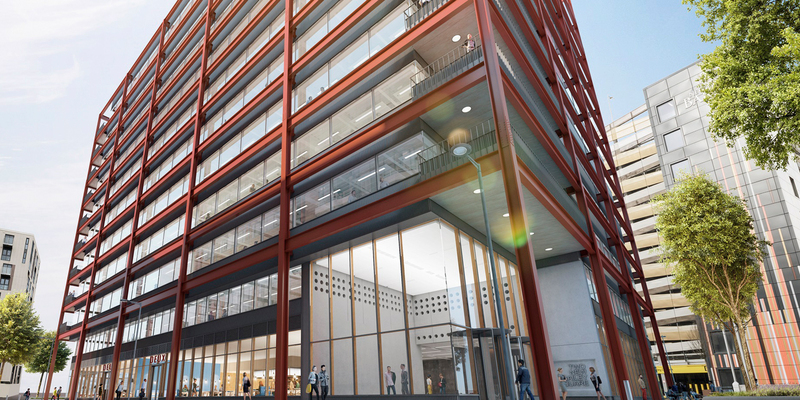 Phil Mayall, Development Director at the English Cities Fund, said: “We selected Aviva Investors after an extensive marketing exercise and we’re delighted to be able to progress development of Two New Bailey Square and help satisfy the increasing demand for high quality, Grade A office space. “Over recent months, development at New Bailey has gathered pace with new offices, residential apartments and a new car park all on site, helping to further establish the scheme as a focal point for business and leisure in the city. Paul Dennett, Salford City Mayor, said: ““This forward funding agreement from Aviva is fantastic news for Salford. The long-term plan is when the building is fully occupied it will provide much needed business rates for our city. This money can then be added to the council’s budget and spent as a way of protecting frontline services. Aviva Investors was advised by King Street Commercial.